Students preparing to enter or return to the nation’s colleges and universities in the coming weeks would be well advised to consider educational paths that lead to careers in burgeoning fields related to the environment, ecology and alternative energy. These areas are expected to fuel significant economic growth and job creation over the next decade, rivaling that of the late 1990s dot.com boom and the housing boom of the early 2000s. As $4.00-per-gallon gasoline and growing concern over global warming spark calls for short-term and long-term solutions, more and more companies are going “green,” not only with their products but also with operations. The movement is creating increased demand for workers in so-called “green-collar” jobs in the form of engineers, architects, project managers, and consultants. As this trend continues, more workers will be needed to implement designs and build projects, potentially creating thousands of jobs. What’s the forecast for Green Jobs? A recent forecast issued by the American Solar Energy Society reported that renewable energy and energy-efficient industries were responsible for the creation of nearly 8.5 million jobs in 2006, a figure which includes about 4.8 million indirect jobs such as accountants, computer analysts and truck drivers. By 2030, the number of direct and indirect jobs related to renewable energy and energy efficiency is expected to reach 40 million, according to the organization’s outlook. With an expected growth rate of about 1.3 million new jobs per year through 2030, “green collar” jobs could present the best career opportunities for a generation of college graduates. The demand for workers is already evident. In a brief review of a few websites specializing in environmental and alternative energy jobs uncovered about 1,500 job listings. 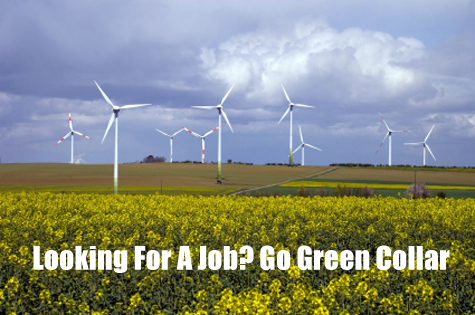 Where are the Green Job openings? Green Dream Jobs (www.sustainablebusiness.com) lists 380 opportunities, including communications director, field energy consultant, project specialist, operation director, program information analyst, green information technology coordinator and director of business development. Additional openings can be found through traditional job sites, such as Monster.com and CareerBuilder, as well as through state and federal employment sites. Furthermore, the push toward increased environmental responsibility is creating new ‘green collar’ jobs in a number of industries and companies where these positions previously did not exist. For example, more and more building design firms are seeking architects and engineers with Leadership in Energy and Environmental Design accreditation as their clients seek environmentally friendly offices. Other companies, such as Wal-Mart, are hiring people to achieve its goals of decreasing its impact on the environment. In 2005, Wal-Mart began its environmental sustainability initiative, with the eventual goal of being supplied 100 percent by renewable energy; to create zero waste; and to sell products that sustain natural resources and the environment. This initiative has created many new positions at the retailer’s corporate headquarters in Bentonville, Arkansas. Among the sustainability positions currently posted on the Wal-Mart career site are senior director of safety and environmental compliance, senior energy manager, director of sustainability, and senior director of sustainability sourcing. Then, of course, there are the growing number of jobs that will be created by companies researching and developing alternative sources of energy. These firms, which once found it difficult to secure funding, are now the darlings of venture capitalists. These companies will need workers to construct solar-powered buildings, cars, wind turbines and alternative fuels. What is the biggest obstacle to the growth of green-collar jobs? The biggest obstacle in the growth of green-collar jobs could be the lack of skilled workers. However, as demand increases for workers in these fields, colleges and universities are instituting specialized degree programs to supply the future green-collar workforce. Dominican University of California offers graduate students the option to receive a Master of Business Administration in Sustainable Enterprise. This green MBA program integrates sustainability principles within each of their courses. A sampling of their course offerings include: Critical Thinking for Leadership in Business Redesign, EcoCommerce Models, Managerial and Environmental Accounting, Social Impacts of Enterprises, Green and Social Marketing, Thriving Regenerative Enterprise and Ecological Economics. Antioch University New England, Bainbridge Graduate Institute and New College are offering similar programs. Vermont Law School has begun offering a J.D. and a Masters of Studies in Environmental Law. The degrees offer job seekers an additional market value. Not only do they possess the knowledge of traditional MBA holders, they hold fresh ideas, enabling the business world to increase their environmental responsibility.